With the new Tamiya Spitfire Mk. IXc readily available on the market, many modellers are looking for alternative Spitfire markings in this scale. One of the decal companies embarking on the trend is Dutch Decal. Their newest product PT3201 Junkers Ju-88A-4, Spitfire F.Mk.V/IX l’Armée de l’Air is designed with the superb 1/32 scale Tamiya Spitfire in mind, along with the big Revell Junkers Ju-88A-4 in the same scale. 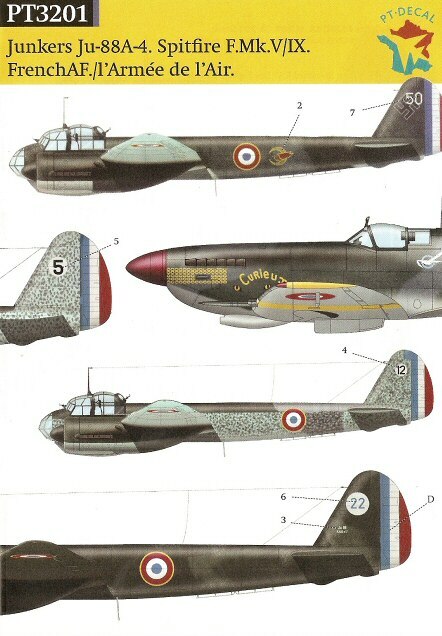 The post-war French Air Force initially operated a miscellany of second-hand Allied and German types, often with paint schemes partially carried over from their pervious owners. 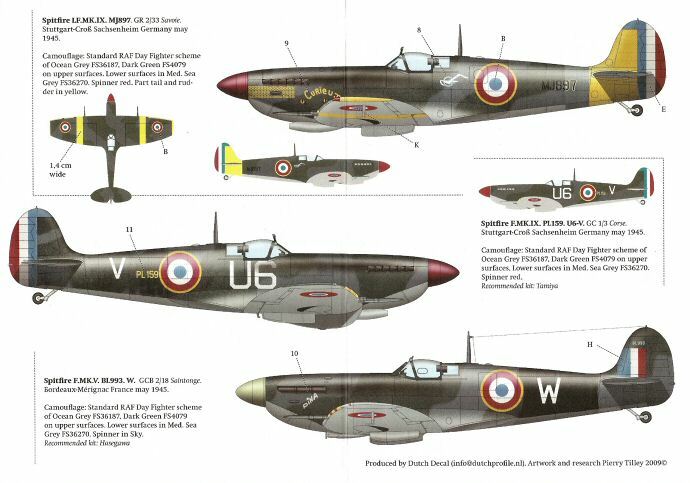 The Dutch Decal sheet is based on colour profiles researched and drawn by Pierre Tilley in the French aviation magazine Aero Journal. Spitfire LF Mk. IXc serial no. MJ897 from GR 2/33 Savoie. Standard RAF camouflage with yellow tail and wing bands, French roundels and excessive nose art. This aircraft served with GR 2/33 in Stuttgart, Germany during 1945. Spitfire F Mk. IXc serial no. PL159 of GC 3/3 Corse, also in Stuttgart, 1945; Standard RAF camouflage, French roundels and non-standard codes U6-V.
Spitfire F. Mk. V serial no. BL993/W GCB 2/18 Saintonge, Bordeaux-Merignac 1945. RAF Camouflage with French national markings, letter “W” and individual name DINA. The Junkers options are as follows. Junkers Ju 88A-4 No. 22 GB 1/31 Aunis, Cazaux, 1945. The A4-sized instructions, nicely designed and printed in full colour, offer a profile views of each aircraft, plus top views where applicable. The sheet provides complete supply complete set of national insignia, plus individual code letters, serials and emblems for each aircraft. Stencilling is not provided. The quality of the decals is very good, with nice colour reproduction and colour printing in perfect register. With the bright colours of the Armée de l’Air insignia and unusual individual markings, this set is perfect for someone looking for a more esoteric markings for their 1/32 Spitfire model. Especially the unusual and colourful scheme for MJ897 should look great on the model. No additional recommendation should be necessary to attract French Air Force fans to this decal set; as its value should be obvious. 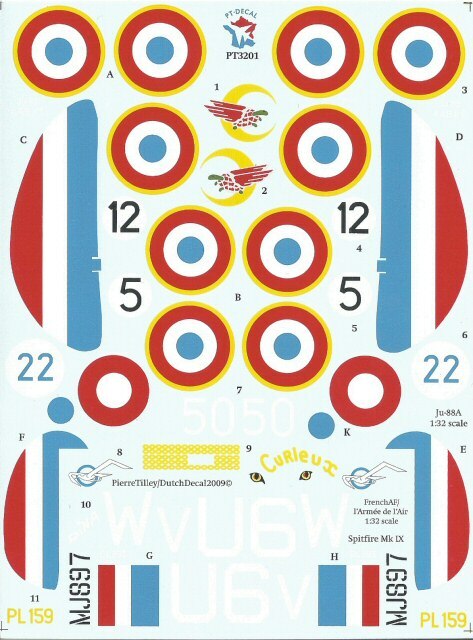 In sum, this is a well-researched and beautifully produced decal sheet which can be recommended without reservations.